State legislatures in the US are considering more than 200 bills – from gun rights to marijuana accessibility – that would nullify or work around various federal laws and regulations crafted in Washington, according to a states’ rights advocacy group. The Tenth Amendment Center told The Hill the 200-plus pieces of current legislation seeking to challenge or wrest control from the federal government mark a climate of both suspicion and empowerment. The center tracks and supports states’ rights initiatives across the country. While federal law ultimately supersedes state law – if enforcement power is exercised – the Tenth Amendment, part of the Bill of Rights, says that the federal government is limited to powers granted in the US Constitution. For instance, a bill that would “block any future federal bans on firearms or magazines” passed the Montana state House on Monday. 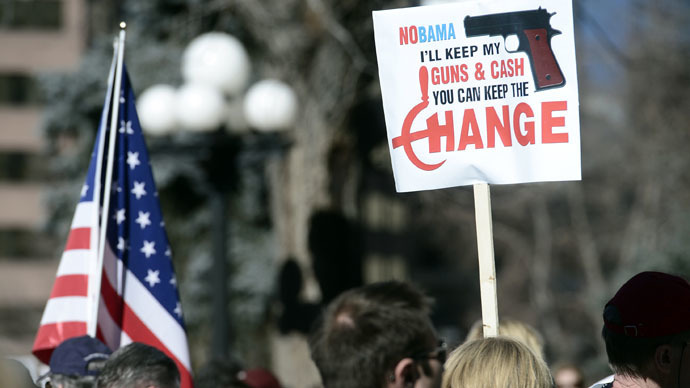 Montana’s bill is one of eleven nationwide, according to the center, that aim to counter federal gun control measures. Twelve states are seeking to challenge federal surveillance authority vested in the likes of the National Security Agency, revealed in June 2013 to be operating a global spying regime to advance American domestic and foreign policy goals. In another 12 states, bills have been introduced to legalize some form of marijuana, whether it be medical, recreational, or both. Both the New Jersey state Assembly and Senate have passed a measure to halt the state’s participation in the Pentagon’s 1033 program, which supplies surplus military weaponry to local law enforcement agencies. Gov. Chris Christie has yet to sign the bill into law. The 1033 program and police militarization overall have received heightened scrutiny – especially after the civil unrest in Ferguson, Mo. last year, when, after a fatal police shooting of an unarmed teenager, the angered community was besieged by local police driving armored vehicles and tossing tear gas into protesting crowds. As RT has reported, New Hampshire is one of five other states seeking laws to curb its participation in federal combat-gear programs. Seven states have introduced measures that would mean opting out of the federal government’s purported authority to indefinitely detain a person within the US, a power that was granted under the 2012 National Defense Authorization Act (NDAA) and the 2001 Authorization to Use Military Force. The NDAA provision was signed by President Barack Obama in early 2012 amid the Occupy movement in the US. Three states – California, Michigan, and Virginia – have passed some form of an anti-indefinite detention law. In recent years, the Affordable Care Act, or Obamacare, has been the favorite federal law that states have tried to redress. According to the National Conference of State Legislatures, 21 states have passed laws and measures that challenge or attempt to opt out of the health reform law. Since the law’s passage in 2010, at least 47 of 50 state legislatures have considered bills to “limit, alter, or oppose selected state or federal actions” related to the federal health law’s passage, according to the NCSL.